Whatever you’re up to tonight, December 30th, make sure you don’t miss the £1 million bingo game at Gala Bingo. Head over to the site right now to pre-purchase your tickets for this exciting one-night-only event. Tonight, only lucky Gala Bingo players will be in with a shot of winning a share of £1 million! If these astonishing cash rewards sound appealing to you, make sure you’re in Gala’s £1 million game tonight. Keep on reading to find out how to join in the fun. 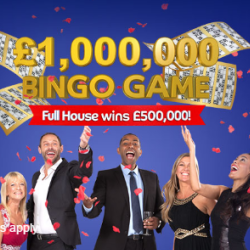 To play the £1 million bingo game, all you have to do is buy your tickets and be in Gala Bingo’s Metropolis Room at 9pm. Tickets cost £2 and players can buy a maximum of 18 tickets each.